What Is The Hip-Opening Mountain Climber Bodyweight Exercise? Most people do mountain climbers as a conditioning exercise—and they do them very inefficiently. They get into a pushup position and alternate driving their knees up to their chests, rounding their backs and twisting their hips. This may get the heart rate up, but it reinforces movement patterns that can lead to injury down the road. You can burn calories and work your heart while also training safe, efficient movement with what we call the hip-opening mountain climber—one of he more advanced movements in the mountain climber series of our Durability curriculum. The hip-opening mountain climber (sometimes called a “full mountain climber”) is just a slower-moving, more purposeful version of the movement you’ve probably done in many exercise classes. It trains you to maintain alignment from your mid back (T spine) to your pelvis when you flex and extend your hips, which helps prevent rounding the lower back on exercises like the squat and deadlift, and their many variations, as well as hyperextending the low back on overhead presses. You’ll develop mobility in the back and hips, and greater stability in the core and upper back/scapulae, resulting in safer training, better movement, and a reduced risk for lower-back pain. Up to 7x per week Flexibility training Steady, deliberate 5–20 Varies by workout. Step 1. Get into a pushup position with hands directly beneath your shoulders and legs extended behind you, feet shoulder-width apart. Tuck your tailbone and brace your core—your head, spine, and pelvis should form a straight line. Draw your shoulder blades back together and downward. Think: “proud chest,” and “long spine.” Take a deep breath. Step 2. Exhale your breath and, keeping your core braced, raise your right leg to the outside of your right arm, landing with your foot flat and the knee pointed straight ahead. Try to maintain your spine and pelvis alignment as you do this. It’s OK if you can’t do it perfectly now, but be aware of how you’re moving so you can correct it. When your leg is in position, pull it inward while driving your right arm out so it touches the outside of your arm firmly. Step 3. Allow your hips to sink a bit and adjust so you re-establish your proud chest and long spine position. Hold for 3–5 seconds. Step 4. Return your right leg back to the original pushup position, and repeat on the opposite leg. –Develops the ability to stabilize the spine and pelvis during movement. – Improves lat and scapular mobility (the ability to move and control your shoulder blades/upper back), contributing to good posture and structural control that will translate to many other exercises. – Include the mountain climber in your warmup before a lower-body workout (it works best as part of a series of hip openers in a full mobility warmup). It’s especially helpful when done before any type of squat, split squat/lunge, or deadlift. – Use the mountain climber as a work capacity exercise to build conditioning. Perform reps faster (but keep proper form) and see how many you can do in a given time. Or, use it as part of a circuit of bodyweight exercises. – Mix it in between sets of your main strength exercises for extra mobility training. Done between sets of squat and deadlift movements, the mountain climber can improve your ability to activate your hips and hold your shoulders in place. This can mean deeper squatting and hinging without rounding your lower back. If the full mountain climber is too challenging for you, start with the kneeling mountain climber, in which one knee rests on the floor. You can also practice working on the mountain climber’s beginning and end positions—the top of a pushup and a deep lunge. When you feel comfortable getting into and holding those postures for a few breaths, the movement in between will come more easily. When you feel you’ve mastered doing the mountain climber slowly, increase the speed at which you perform reps. You can also add rotation to the end of the movement, as in the stacked bow/reverse stacked bow. See the hip-opening mountain climber used as part of a bodyweight conditioning circuit HERE. 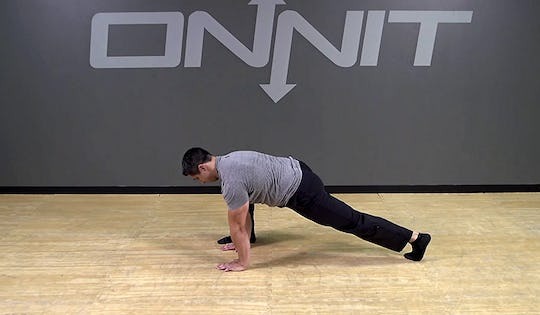 The hip-opening mountain climber also appears in the Onnit 6 Bodyweight program, a six-week transformation plan you can do in your home.